Giovanni Antonio Omodeo (also Amadeo), Italian architect and sculptor. In 1466 he was engaged as a sculptor, with his brother Protasio, at the famous Certosa, near Pavia. He was a follower of the style of Bramantino of Milan, and he represents, like him, the Lombard direction of the Renaissance. He practised cutting deeply into marble, arranging draperies in cartaceous folds, and treating surfaces flatly even when he sculptured figures in high relief. Excepting in these technical points he differed from his associates completely, and so far surpassed them that he may be ranked with the great Tuscan artists of his time, which can be said of hardly any other North-Italian sculptor. While engaged at the Certosa, he executed the door leading from the church into the cloister. He also produced many marble reliefs for the facades of the tombs in the Certosa. After completing his work in Pavia, he went to Bergamo to design the tomb of Medea, daughter of the famous condottiere Bartholomeo Colleoni, in the Colleoni chapel. He returned to Pavia in October, 1478. On the death of Guiniforte Solari (1481), Amadeo had been temporarily appointed to succeed him as head architect of the Certosa, and was commissioned to make a fresh design for the facade, with the assistance of Benedetto Briosco, Antonio della Porta, and Stefano di Sesto. But it was not till 1490, when he was confirmed in his office, that he made the design which was accepted, and which was subsequently carried out by him and his successors. About 1490, after an absence of eight or nine years, Amadeo returned to his post at the Certosa and received the contract for the interior, and also for the duomo of Milan. He was joint architect of the Certosa and of the cathedrals of Pavia and Milan, until he undertook to crown the latter with a cupola in Gothic form, which aroused much opposition and criticism. He then resigned his other offices and took up his residence in Milan, where, assisted by his colleague Dolcebuono, he commenced his work, in 1497, according to the accepted model, and carried it up to the octagon. 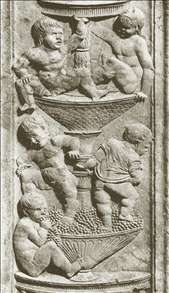 As its solidity was then questioned by Cristoforo Solari and Andrea Fusina, the directors stopped the work (1503). After this defeat he left Milan, with his brother Andrea, and resided at Venice for several years, during which he produced a St. George for a chapel in the church of La Carita, also a statue of Eve. See more details about "Playing Children"